Alpine Carpet Cleaning > Shower Screen Cleaning > Why are glass shower screens difficult to clean? Ever wondered why it’s almost impossible to remove calcium and hard water stains off your glass shower screens? Trust our 20 years experience in the cleaning industry, when we say that retail & natural DIY products cannot remove hard-water staining off glass products. 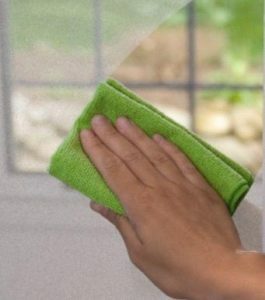 They can remove heavy soap scum build up (if this is your problem, then read our blog on removing soap scum the easy way at https://www.alpinecarpetcleaning.com.au/how-to-easily-clean-your-shower-screens-with-soap-scum-build-up/), however they can’t actually get rid of the calcium deposits. Here’s why (the tech stuff)! Although it may look and feel like it, glass is not completely flat. 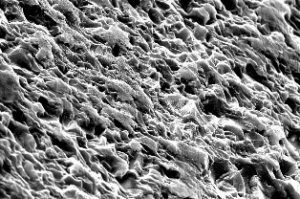 If you looked through a microscope (see photo), the view is like a mountain valley range, perfect for trapping calcium and other minerals which build-up in your shower recess. Untreated glass is porous and as a result, it absorbs mineral deposits and soap scum, making it more and more difficult to clean. Over time the shower glass will discolour and etching will occur in harsh environments. A common harsh environment is in the household bathroom. The shower screen is subject to mineral deposits from the hot water used, moisture is trapped under the shampoo chemicals, soaps, body fats etc. There it forms into a solid crystalline substance rather liken to the scale in your kettle this condition continues to build over time, each shower making it harder and harder to remove. Being left unchecked long enough it will become impossible to easily remove all the build-up as it now also contains the mineral called “silica”. Your glass shower screen contains silica (silica sand=glass). The silica molecules recognise each other and end up with the silica minerals bonding to each other, making it all but impossible to remove due to silica etching. Unfortunately, silica etching is permanent, so this is why you should get a professional shower screen cleaning company in to remove this buildup effectively before any real damage to the shower screen panel can occur. How we do it – Getting Your Shower Screens Perfect Again! There are many supermarket and DIY products on the market which claim to clean your shower screens. When we first started in this business, we tried them all! From lemon juice, bi-carb & vinegar, to the strongest shop bought chemical products to powerful smelling bleaches. Trust us, they don’t work. All they are capable of is removing soap scum build up, and many will end up giving you a headache. It’s the hard water staining (calcium, minerals and silica) that you need removed, which these products cannot achieve. We use a commercial biodegradable cutting-edge cleaning/polishing compound, along with professional polishing tools to restore your shower screens and glass balustrades, to a sparkling ‘as new’ condition. We pride ourselves on achieving results of between 90 – 98%, providing the glass has not been damaged or scratched by previous attempts at cleaning or is etched by silica deposits. 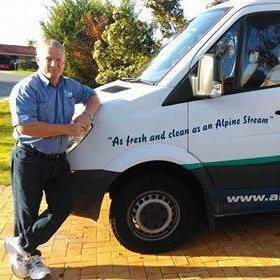 Check out our video at https://www.alpinecarpetcleaning.com.au/shower-screen-cleaning-perth/ to see how we do it! Once we’ve done the hard work of removing the hard water staining/calcium build up, so your shower screens are looking sparkling clean again, we always suggest you use a squeegee or glass microfibre cloth to wipe down after every shower, to keep the calcium at bay. Also, highly recommended to save you any more calcium build up heartache, you can also opt to have our new “lifetime glass protection” product from Nanovations applied to your shower screens after cleaning, for an investment of just $75+GST per screen. Ask us for more details! Nice Article!! I want to ask this thing that why this is difficult, so thank you for providing me this information!